As an adult, he worked for the Imperial Police in British occupied India. A masterpiece of political satire, Animal Farm is a tale of oppressed individuals who long for freedom but ultimately are corrupted by assuming the very power that had originally oppressed them. The story traces the deplorable conditions of mistreated animals who can speak and who exhibit many human characteristics. After extreme negligence by their owner, the animals revolt and expel Mr. Jones and his wife from the farm. 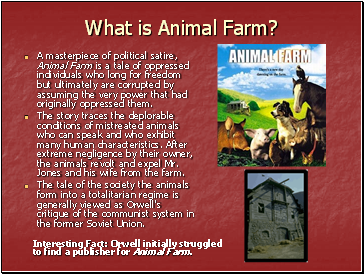 The tale of the society the animals form into a totalitarian regime is generally viewed as Orwell's critique of the communist system in the former Soviet Union. Interesting Fact: Orwell initially struggled to find a publisher for Animal Farm. 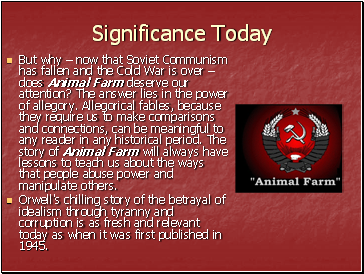 But why – now that Soviet Communism has fallen and the Cold War is over –does Animal Farm deserve our attention? The answer lies in the power of allegory. Allegorical fables, because they require us to make comparisons and connections, can be meaningful to any reader in any historical period. The story of Animal Farm will always have lessons to teach us about the ways that people abuse power and manipulate others. Orwell's chilling story of the betrayal of idealism through tyranny and corruption is as fresh and relevant today as when it was first published in 1945. 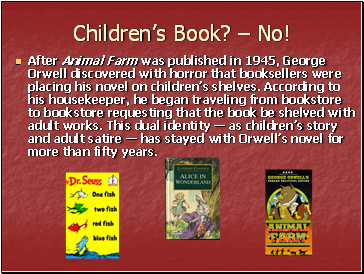 After Animal Farm was published in 1945, George Orwell discovered with horror that booksellers were placing his novel on children’s shelves. According to his housekeeper, he began traveling from bookstore to bookstore requesting that the book be shelved with adult works. This dual identity — as children’s story and adult satire — has stayed with Orwell’s novel for more than fifty years. The fable is one of the oldest literary forms - much, much older than the novel or the short story. A fable is usually short, written in either verse or prose, and conveys a clear moral or message. 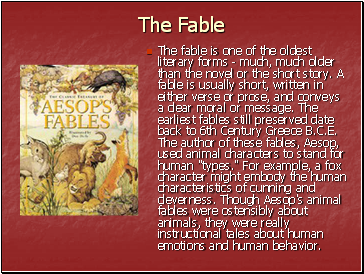 The earliest fables still preserved date back to 6th Century Greece B.C.E. The author of these fables, Aesop, used animal characters to stand for human "types." For example, a fox character might embody the human characteristics of cunning and cleverness. Though Aesop's animal fables were ostensibly about animals, they were really instructional tales about human emotions and human behavior. The most popular animal fables of the 20th Century are the Just So Stories (1902) written by Rudyard Kipling. 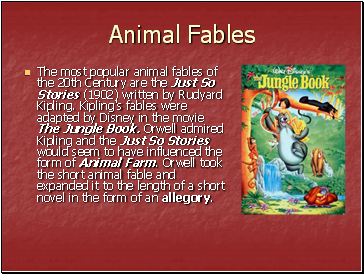 Kipling's fables were adapted by Disney in the movie The Jungle Book. Orwell admired Kipling and the Just So Stories would seem to have influenced the form of Animal Farm. Orwell took the short animal fable and expanded it to the length of a short novel in the form of an allegory.